Home > Science > Faith & Science > Eating All You Can This Eid? The spectrum of diseases induced by overeating starts from small discomforts - such as indigestion and sleep disorders - to a long, horrifying list of complications - such as "Type 2 Diabetes, Hypertension, heart diseases, liver and gallbladder diseases, and decreased fertility. This feast-like illustration is the typical scene at an `Eid Al-Fitr gathering, especially as an aftermath of a month of fasting! While there is nothing wrong with eating nor with enjoying food for that matter, this picture is just a bit too much. With consumerism booming and restaurants at every corner, this is the plentiful approach we have for eating these days. While the specific psychology behind overeating differs from one individual to another, there are certain common triggers that cause people to stuff themselves. Situational Triggers: Eating because of the surroundings whether it is popcorn at the cinema or a candlelit dinner. Almost all social occasions have a time for food cut out if not completely revolving around it. Physiological Cues: Interpreting our bodily cues requires skill and discipline. Tiredness can mean a lack of energy and thus justify food intake, and it can also merely mean lack of exercise. If we examine our own eating motives, many of us will find ourselves easily straddling all five triggers. “A person fills no vessel worse than his [or her] stomach. It is sufficient for the son of Adam to have a few mouthfuls to give him [or her] the strength he [or she] needs. If he [or she] has to fill his [or her] stomach, then let him [or her] leave one-third for food, one-third for drink, and one-third for air.” (At-Tirmidhi and Ibn Majah). Nowadays, the harms of filling our “vessel” are well-known. To get a better idea about the risks associated with overeating, we consulted Dr. Ahmed Mohamed Aboulghate, a member of the Egyptian Medical Association for the Study of Obesity (EMASO). Aboulghate asserted that while modern-day medical advances have significantly increased human life expectancy, this may be the first generation to show a declining slope; all because of obesity. Obesity also increases the risk of “complications during pregnancy, respiratory disorders like sleep apnea syndrome (serious life-threatening attacks of inability to breathe during sleep, because of accumulation of fats in the airways), osteoarthritis (joint inflammation, especially of the lower back and knees), as well as up to 20 types of cancer,” said Aboulghate. And as if these physical problems were not enough, Imam Shafi`i, an Islamic scholar who is considered the founder of the Shafi’i school of jurisprudence (fiqh), pinpointed several intangible harms brought about by overeating. These include the weighing down of the body, hardening of the heart, driving away insight, sleepiness, and weakening of one’s aptitude for worship. (Al-Duqur). Allah created a broad selection of delicious foods for us to enjoy, not abuse. Eating is a means to build and renovate a healthy and energetic body, not an end in itself. “Just because you stop eating before you are totally full doesn’t mean you aren’t enjoying your food,” explained Dr. Adel Abdul-`Aal, a renowned Egyptian doctor of alternative medicine. (Abdul-`Aal). By savoring food and eating at a relaxed pace, Abdul-`Aal guarantees you will appreciate your food much more. And as in all other aspects of life, moderation is the key. While listening to our body’s needs is the goal; when an actual loneliness-induced craving strikes or the time comes to “grab a bite” with a friend or to plan a birthday party, many of us might find that total avoidance of the five aforementioned psychological triggers is impractical. The fact is, we easily fall into the pitfalls of social, situational, and emotional eating, among others. Refraining from entertainment venues and declining family invitations are not the answer; the goal is to manage the quality and quantity of our food intake. 1. Stay busy. If you constantly have something to do, it will keep your mind off food. 2. Take a walk. While playing sports, the body releases hormones called endorphins that positively affect the mood and psychological state of the person, explained Aboulghate. 3. Chew well and take pauses between mouthfuls. This helps your digestion and makes you feel full faster. (Abdul-`Aal). 4. Do not gulp down food while walking or doing something else. (Abdul-`Aal) Set a separate time for meals that is completely focused on the food, and savor it. 5. Preferably set that time for the whole family to eat together. Gathering for food is a sunnah (Prophetic tradition) and eating together slows you down quite a bit too. “Eat your food together, for you will thereby be blessed in it.” (Abu Dawud and At-Tirmidhi). 6. Drink plenty of water.. Sometimes, the body craves water not food. (Abdul-`Aal). 7. Eat fruits and vegetables, and drink fresh juices. The water in the fruit and vegetables makes you feel hydrated, the fiber gives a sense of fullness, and they provide the body with an amount of energy that is “just-right” without overburdening it, according to Aboulghate. “Some of them, like cucumber and cabbage, even contain ‘negative calories’ because the amount of energy required to digest them is more than their caloric content.” So you are actually losing weight munching on them! 8. Eat three meals a day, with 3-5 hours spacing between each meal. Be in harmony with your body’s biological timing. (Abdul-`Aal). 9. Wait for at least two hours after dinner before going to sleep. (Abdul-`Aal). 10. When you feel like you’re not hungry anymore (half-full), get up and brush your teeth. It changes the taste of your mouth and indicates closure. Do not hang around food longer than necessary! 12. Use the “rule of two.” Only serve a maximum of two items on your plate. You can always go back for two others when you are done! The less variety on your plate, the less overeating you will be doing. (Mieszkowski). 13. “We eat with our eyes, not with our stomach,” said Prof. Wansink. 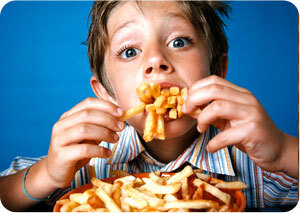 (Mieszkowski) In fact, we eat 92 percent of what we put on our plates. Downsize your serving plates, drinking glasses, and meal dishes. Also, dish out packaged food (such as chips) beforehand to keep track of the amount you consume.